Despite its name, the Rue de Provence behind the Grands Magasins is far from being a luminous and balmy passageway. Originally a rustic path alongside an open sewer, it is now a banal commercial thoroughfare, with the sewer having simply been covered over with bitumen. How strange to think that at number 122 used to stand one of the most exclusive and fashionable destinations in the city, the One-Two-Two bordel. This has always been an area linked to prostitution, with 19th century scenes described in the works of Gaston Leroux and Balzac. Mostly though this has been of the seedy kind that still exists today, but the One-Two-Two establishment was of a different style altogether. It was a venue that attracted Counts, Princes, actors and politicians, men and women. The first three floors of the building were the original townhouse of the Maréchal Murat, a Napoleanic war hero who was later declared King of Naples. It was purchased in the early 1930s by Marcel Jamat who then immediately set out on a large-scale rebuild, adding an extra four floors and an extravagant interior. 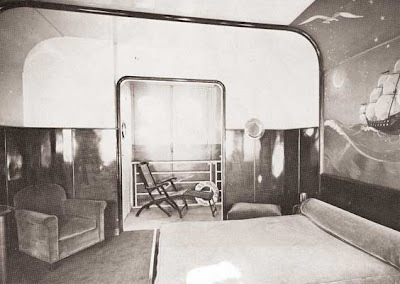 Jamet wanted a place that would fulfill almost any fantasy or fetish, with each room decorated according to a particular theme. There was a lavish Rome themed room, a mysterious African room, recreations of luxurious yachts, Indian colonial scenes and even a rural countryside room complete with straw. These were just the more mainstream areas though. For more extreme fetishes, clients had to continue climbing the stairs. As Fabienne Jamet, wife of Marcel and maitresse of the establishment, said, “Plus on allait vers le ciel, plus on se rapprochait de l'enfer“ (The closer one got to the sky, the closer one got to Hell). On the higher levels were the torture rooms, places where visitors could be humiliated or even reenact the crucifixion! All this took place behind firmly closed shutters, creating a world where natural night was banished. It was not necessarilly these facilities that made the establishment famous however. These rooms were used mostly in the afternoon by anonymous clients, but in the evenings it was a fashionable place to be seen. Visitors would congregate in the Boeuf à la Ficelle restaurant, with visitors known to have include Jean Gabin, Charlie Chaplin, Marlène Dietrich, Cary Grant, Mae West, Katharine Hepburn and Humphrey Bogart. This was not just any restaurant however, with diners enjoying caviar and champagne served by girls wearing only high heels and a camelia in their hair. Later they would retire to the Salon Miami and enjoy brandies and cigars and simply talk to the working girls. As one of them later recalled, "on nous payait pour bavarder, un peu comme des geishas" (we were paid for talking, a little like Geishas). Number 122 Rue de Provence today. 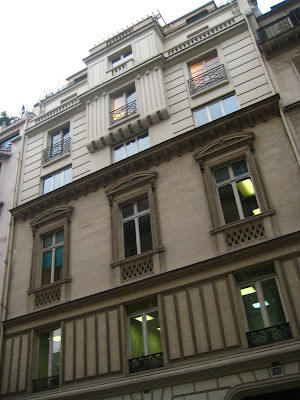 Jamet's additional four floors are clearly visible above the original townhouse. On an average day, 50 girls would be working with an additional 40 people employed for auxiliary tasks. There were people to cut the girls' hair and give them manicures or pedicures. Doctors came every two weeks to inspect them, an essential part of being able to run a brothel in the city. Everything was clean, scrubbed and disinfected, but it would never be possible to remove the internal scars of the girls. They had been chosen because good fortune had given them exceptional or fashionable body forms, and whilst conditions in the establishment may have the best in Paris, a working day was still 14 hours, and the outside world was still a place of sordid housing, and partners who were often pimps or who simply drank or gambled away their earnings. The fame of the establishment lasted barely fifteen years. In 1946 a shamed post-war France voted to close down all brothels and the One-Two-Two was given 6 months to open the shutters and shut the doors. In reality, it had been tainted by the war when German officers became the only clients. The building still stands today, unchanged, but the torture rooms have been replaced by Solicitors. We can now look inside the windows and imagine who passed through here but it is very difficult to picture the scene with today’s décor. The glimour of glamour that the Rue de Provence once had is now past, and once more it is little more than a covered sewer. It was very elaborate. I'm sure if one investigated rigorously, one could find a similar establishment in any major city in the world. the torture rooms have been replaced by Solicitors. How appropriate Plus ca change, plus ca la meme chose. Well said, Martha. I was along the same line of thought! Adam, what an extraordinary story. The facade photos are so out of line with the story, it's amazing. I can only imagine the fascinating facts you might have dug out had you done the same kind of research about Avignon's Chambre de Commerce. I'm not cut out for such hard work but I regret it. That draws me to wonder how you work. Did your readings about the one-two-two lead you to a stroll down rue de Provence? I presume so, because you couldn't have found that out by chance. Starman: I agree that there is nothing 'unique' about the establishment, but as Nathalie notes, what is interesting is how so little has changed and yet how everything has changed. The building is identical to many others and it would be impossible to guess its previous identity. Martha: The Yellow Pages told me that there are solicitors in this building today, but of course I have now way or knowing whether they are in the torture rooms or not! Nathalie: In this case it was the other way round. 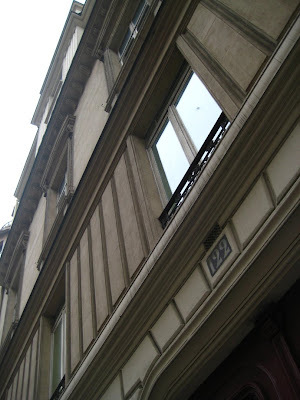 I often walk down the Rue de Provence as I work nearby, and it was only when I saw that the One-Two-Two (which I was vaguely familiar with without knowing where it was situated) had been located in this street that I felt compelled to investigate. I can't imagine what it must be like to work in the building today - I'll have to try and ask somebody! It's the thought that counts...I think. The way of entering the One-Two-Two (described in the link site) reminds me of how one enters a Parisian bank: one door closes behind you; you are all alone; then the next door opens. 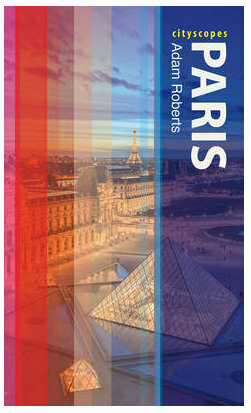 Thanks for a fsacinating introduction to a bit of Paris history. I have been off for a week! ... and I found some very interesting posts - again! I was fairly well informed about the Maison Dorée and the 122 (never visited! ), but what you dig out is always so fascinating! Fantastic work! (which describes itself as 'promoting and nurturing the leather industry throughout the country') is also based there... another apt successor to the former occupiers no doubt!